Kanyakumari has received moderate rainfall this morning and a few low lying areas in the district are still inundated. The district is largely powerless after Cyclone Ockhi with more than 4,000 power lines damaged. Cyclone Ockhi, which claimed 13 lives in Tamil Nadu and Kerala, has now moved beyond Lakshadweep, the weather department said bringing huge relief to the people of the rain-battered states. However, many fishermen are still missing and warships have been deployed to comb the southeastern coast for fishing boats missing in wild seas. Ockhi is now expected to travel north towards Mumbai and Gujarat in the next 48 hours, according to Indian Meteorological Department (IMD) Director S Sudevan in Thiruvananthapuram, though it is likely to lose intensity, reported news agency Reuters. As many as 531 fishermen, stranded in the choppy waters off the Kerala and the Lakshadweep coasts due to Cyclone Ockhi, have been rescued, Kerala Chief Minister Pinarayi Vijayan said today. So far 393 people from Kerala have been rescued, Mr Vijayan said, as the state government announced a compensation of Rs 10 lakh to the family of those who died in the storm. Rescue operations are still on with Navy, Air Force and Coast Guard's coordinated efforts in Thiruvananthapuram-Kollam coastal area. In Tamil Nadu, 60 fishermen are still missing and the Navy has been called in for their rescue. 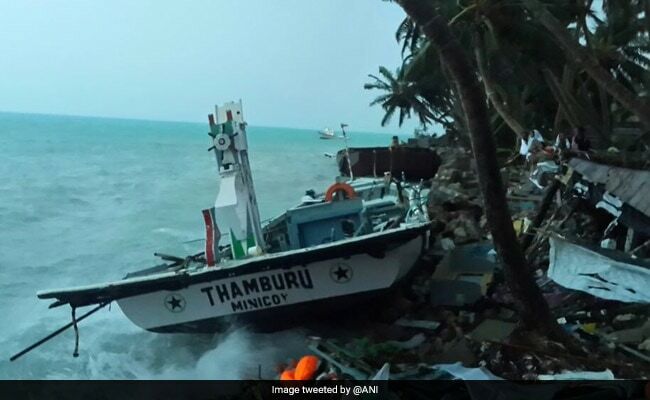 The Tamil Nadu government has also requested the centre to deploy helicopters of the Navy and the Coast Guard for the search and rescue efforts. Meanwhile, distressed family members of missing fishermen blocked the National Highway in Thiruvananthapuram's Poonthura alleging rescue operations have been inadequate. Most of the deaths by Cyclone Ockhi were caused by trees uprooted by destructive winds raging at 130 km per hour. In Sri Lanka too, the cyclone killed seven people. 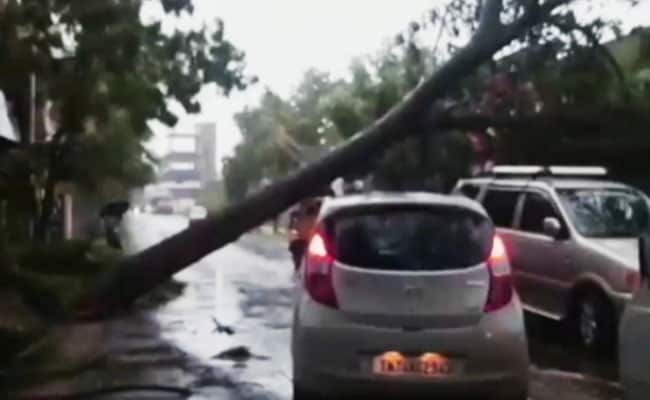 Torrential wind and rain unleashed by Cyclone Ockhi has shut down schools in Chennai. Tourists in Kochi have been told to stay away from popular beaches where huge waves are pounding the shore. In Lakshadweep, five fishing boats were damaged earlier today at Kalpeni island as water level rose due to heavy rains. Coconut trees have been uprooted in various places and houses damaged in eastern Kalpeni and Minicoy, official sources said, adding the extent of the damage was being assessed. 31 relief camps have been opened in the 10 inhabited islands. So far, 1,047 people have been evacuated to the relief camps. Tamil Nadu's Kanyakumari district, one of the worst affected, still remains largely powerless with more than a thousand people stranded in rescue centres. The district has received moderate rainfall this morning and a few low lying areas there are still inundated. 4,000 power lines in the district have been damaged by the cyclone and officials said it may take close to a week for the entire power supply to be restored. The Tamil Nadu government has released Rs 25 crore to restore power supply in the district. Prime Minister Narendra Modi has assured to provide adequate help to Tamil Nadu Chief Minister K Palaniswami during a telephone conversation between the two last night. The Tamil Nadu government has said it will soon seek central funds for the damage caused by Cyclone Ockhi. Since this morning there has been no reports of rain from other parts of the Tamil Nadu. In Kerala too weather has largely cleared out with intermittent rain in some parts. A Central Water Commission advisory yesterday said the west-flowing rivers in Thiruvananthapuram, Kollam, Pathanamthitta, Idukki, Kottayam, Alapuzzha and Ernakulam were likely to rise over the next 24 hours and then slowly fall as the rains reduced. Seven people have been killed in the state. The advisory also said that the Amaravathi and Bhavani rivers and their tributaries in the Cauvery basin were also expected to receive sufficient flows, increasing the water levels in the Amaravathy, Moyar, Pilloor and Bhavanisagar dams in the Nilgiris, Coimbatore and Erode districts of Tamil Nadu. The Somasila and Kandaleru projects in Nellore district of Andhra Pradesh were also likely to receive "significant inflows" due to the depression, which was likely to affect the southern parts of the state from December 5 onwards. "There is a likelihood of a rapid rise in the water levels of the Suwarnamukhi and Kalingi rivers in Chittoor and Nellore districts," the commission said. The storm has been named Ockhi by Bangladesh which means "eye" in Bengali. In 1999, more than 8,000 people were killed when a cyclone battered the eastern state of Orissa.